Drop Line is a drop tower in Timber Canyon at Dollywood. While it's not the best, it is also recommended. 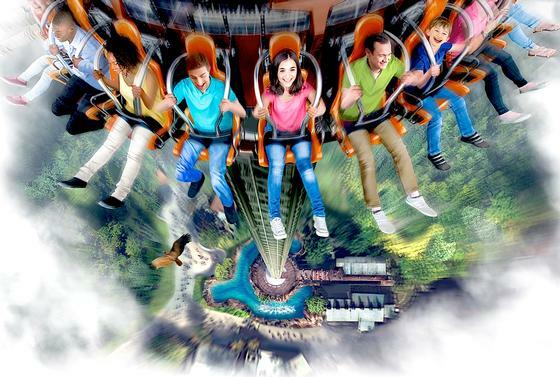 A 200-foot-drop tower, debuting in 2017. While drop towers are a dime a dozen, this one yields spectacular panoramic views of Dollywood's impressive scenery and even more impressive backdrops. I've hiked portions of the Great Smokies that didn't offer views as stunning as this ride offers. I only wish this ride had an on-ride photo or video incorporating the view. Oh, and just as soon as you're finished taking it all in, POW. A mighty drop. A must if only for the view.